Health care. Public education. War and peace. Science and religion. The economy. Christian social action. Spiritual growth. 21st century political talking points? Hardly just that. John Wesley, an 18th century British clergyman, addressed these very issues in his own time. His creative answers may open your eyes to new responses for our own frenzied "postmodern" concerns. 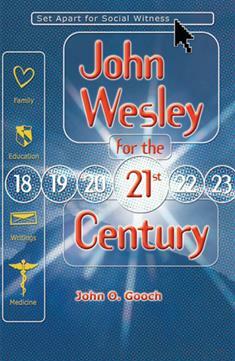 Gooch opens the fascinating character of Wesley by looking at these strikingly current topics. He shows how Wesley's ministry grew out of his desire to live a holy life and to invite others to walk in Christian discipleship. His message of grace and salvation led Wesley to suggest innovative solutions to problems of his time, including poverty, education and a host of other issues. "Wesley cared deeply about issues, not just in themselves, but because of their impact on persons created in the image of God," writes Gooch. "We need to care deeply about them as well. ItÆs not just 'talking the talk' but about 'walking the talk.'" John Wesley for the 21st Century addresses matters very much in the news today — from a theological foundation. Each chapter includes questions for reflection, making this book a great study for individuals and small groups.